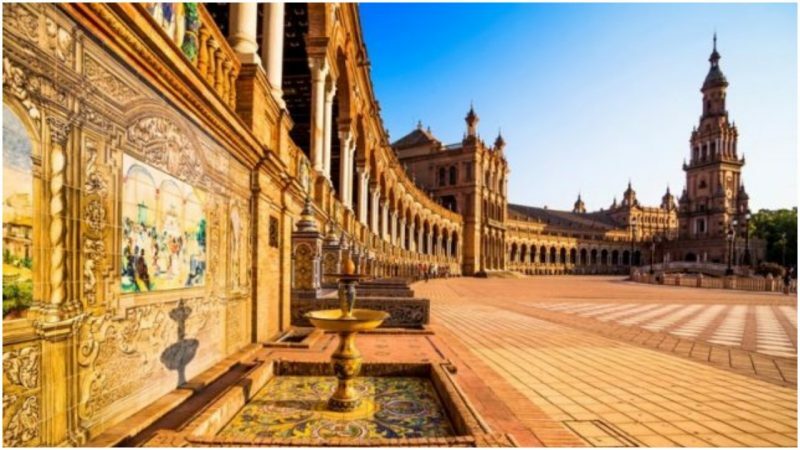 Grandiose and gorgeous, the massive building of Plaza de Espana in the Andalusian Spanish city of Seville is a must-see. Depending on personal preferences, this place can be perceived as striking and stupendous or fussy and even pompous. However, its historical significance and the intricate aesthetic aspect of the architecture is compelling enough to be worth anyone’s time for a visit. 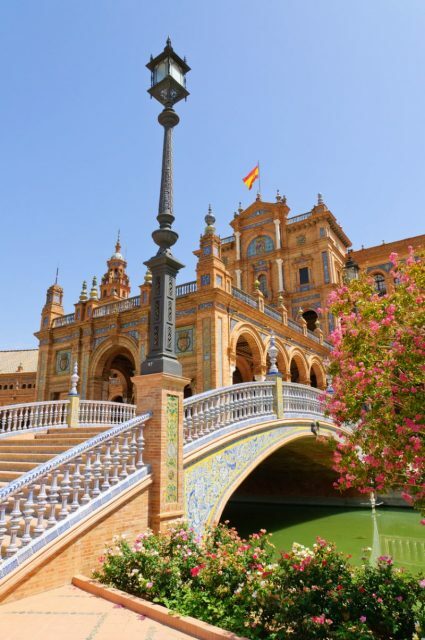 Known as “the Venice of Seville,” Plaza de España is a congruous complex designed and built by the Sevillian architect Anibal Gonzalez in 1928. 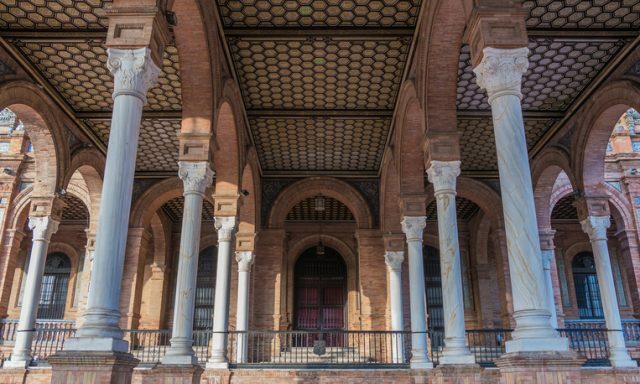 Gonzalez, inspired by the regional Revival style that was popular at the time, built the structure in a fusion of Renaissance and neo-Moorish elements with typical urban features of the city: exposed red bricks, colorful painted ceramic tiles, and wrought iron. 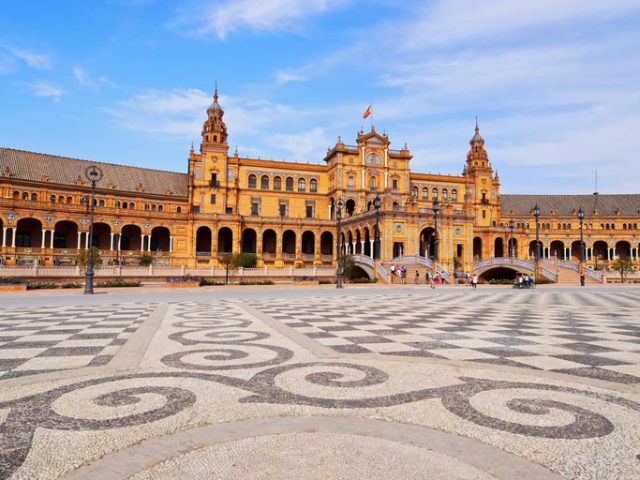 The main motive for the Plaza’s erection was the Ibero-American Exposition, a world fair held in Seville in 1929, as the Pabellon de Andalucia. The exposition was held to strengthen the ties between Spain, Portugal, and their former colonies, so each country was represented by a specific pavilion at the fair. Plaza de Seville was presented as the centerpiece among the exhibits, designed to enchant the visitors and elevate Seville as a place of innovative industry and rich talents. The surroundings of the building enhance its grandeur, as the Plaza in nestled in the greenery and under the shadows of Maria Luisa Park, right next to the pedestrian avenue Avenida Isabella La Catolica. The Plaza’s surface measures 494,410 square feet. The floor plan is semicircular with a tower on each side, south and north of the area, tall enough to be visible from different points in the city. 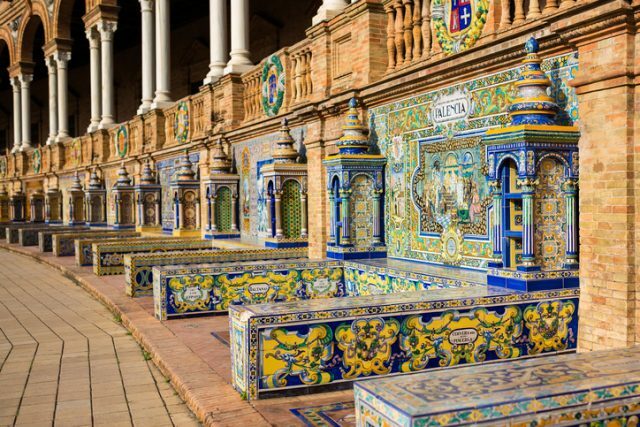 A picture of the courtyard of the central building of the Plaza de España in Seville. The tower frame is connected by a long colonnaded gallery which develops to the central building that includes a ground level portico and first-floor balustrade with stretched out balconies reached by the staircases on the main floor. Selfie lovers would enjoy these since they provide a whole-length overlook of the building. Along the front of the building runs a wide promenade which is occupied daily by the many tourists who come to admire the decorated complex. 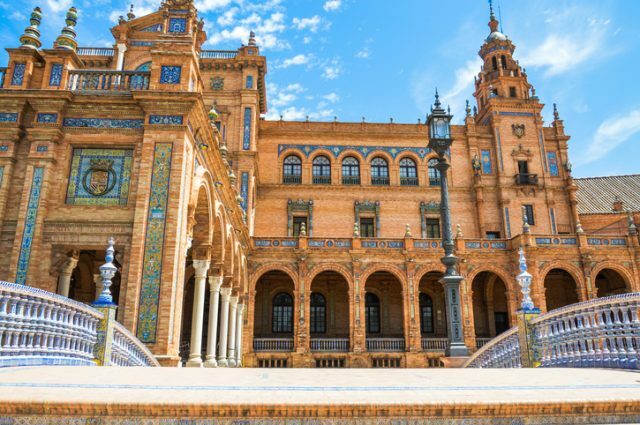 During the hot, balmy Andalusian summers, visitors would be delighted to come near the dazzling fountain, which stands in the center of the square, in front of the building, as well as to the 1,600-foot-long canal traversed by four appealing, Venetian-style bridges. Each of the bridges represents one of the four ancient Spanish kingdoms: Aragon, Navarre, Leon, and Castille. This charming water oasis amid the arid-looking surroundings offers a pleasant experience if one opts to rent one of the small boats available and row it on the canal. Walking down the wall by the canal one’s eye would be inevitably caught by the explosive colorful assemblage of azulejos (traditional painted ceramic tiles) covering the 58 benches with alcoves, each standing for one of Spain’s provinces, including a designed map and a tableau depicting paintings from each province. The magnificent Andalusian tiles are also integrated into the streetlamps, the walls, the balustrades and the four ornate bridges on the site. The daunting scenery of Plaza de Espana has attracted many filmmaking productions which instantly fell for its unique beauty, putting it on top of the list of filming locations. Over the decades, films such as Lawrence of Arabia, Star Wars: Attack of the Clones and Sasha Baron-Cohen’s The Dictator were filmed at the Plaza. Star Wars‘ fans, especially those who consider themselves location hunters, would feel like they’re really accompanying Anakin (Hayden Christensesn), Padme (Natalie Portman) and R2-D2 on Planet Naboo while exploring the site. The original shots are made in the center of the plaza at a rectangular structure, which is bounded by the two bridges and at the curved hallway of the main building, open to the right. Today, the building houses several local government offices such as the Seville Town Hall and the general office of the regional army, while the various mansions in the adjacent Maria Luisa Park have been turned into museums.